Mumbai: Reliance Retail Ltd (RRL) would create half-a-million jobs and provide indirect employment to another one million over the next three years. “Reliance Retail plans to go pan-India by opening 30 Reliance Mart hypermarkets in FY 08 and over 500 by 2010-end. This would involve an investment of Rs25,000 crore, create half a million jobs and provide indirect employment to a million more," RIL president and chief executive (operations and strategy), Raghu Pillai, told reporters here. “Organised retail, which is expected to touch $60 billion by 2011, can trigger socio-economic transformation on an unprecedented scale," Pillai said. Spread across 1.65 lakh sq ft, RRL’s Reliance Mart will have over 95,000 products in fresh produce, food and grocery, home care products, apparels and accessories, non-food FMCG, consumer durables, auto accessories, lifestyle products and footwear, among others. The store also houses its own fresh bakery, serving bread and bread products, ready-made batter and loose tea and pickle for housewives. Reliance Retail expects a topline of Rs1,000 per sq ft per month from Reliance Mart, Pillai said. The hypermarket format is the latest to be unveiled. Last year, Reliance Retail launched its fresh food format store Reliance Fresh and consumer electronics store Reliance Digital. RRL also plans to enter tier-II and tier-III cities by launching 700 Reliance Town Centres (RTC) in the next four years. The RTCs will be spread over 30,000-100,000 sq ft areas depending on the size of the town. 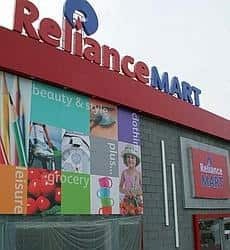 Talking to PTI on the sidelines of the Reliance Mart launch in Ahmedabad, chief executive, Hypermarkets, K Radhakrishnan said: “The major chunk of the Rs25,000-crore investment will go into setting up 700 RTC centres. It will house shopping centres, markets, health centre, multiplexes, auto centres and vocational centres." RRL has already finalised 1,024 properties for Reliance Fresh, of which 350 stores are likely to be opened this year. RRL also intends to re-position its Vimal brand of textile and apparel, said Parimal Nathwani, executive, corporate affairs, Reliance. Commenting on the Left Front government in Kerala working on a new law to ban corporate retailers, Pillai said “we are an Indian company and we follow the law of the land. We will wait for the new legislation. We should be given a level playing field."